Stephen Kenny’s legacy as Dundalk FC manager took another growth spurt while in Tallinn. That having been concluded as those of us returning on the charter flight were awaiting Anchor Tours’ arrival at Dublin Airport last Friday morning. We had the pleasure of watching the Lilywhites claim their third European away win under Kenny just hours earlier. Only two had been recorded before his tenure - those coming decades ago against FC Zurich and Linfield. Surely now, with three league titles, an FAI Cup, two League Cup wins and a Euro record which is the envy of the nation, Kenny can finally be regarded as the greatest manager the League of Ireland has seen. The thought remained in my head all the way home and as we arrived back to the place we had departed from a little under 72 hours earlier - ‘The Home of Football’ itself. Having been one of the lucky thousand or so who took in the voyage to Alkmaar two years back, when the record breakers became history makers in picking up a group stage point, Tallinn was hardly expected to top that experience. And it didn’t, but it’s the best of the rest. Anyhow, with the slagging now in full throttle, it was full steam ahead to the capital for an early flight out. The joke, however, was on me when we landed and I began questioning the currency and where a group of enthusiastic Irish would purchase some of the local tender. By the time I learned that, in fact, the few flimsy notes in my back pocket were worthy of the shopkeepers’ attention, we’d arrived at a bar aptly named ‘Troika’ - the EU are here too! 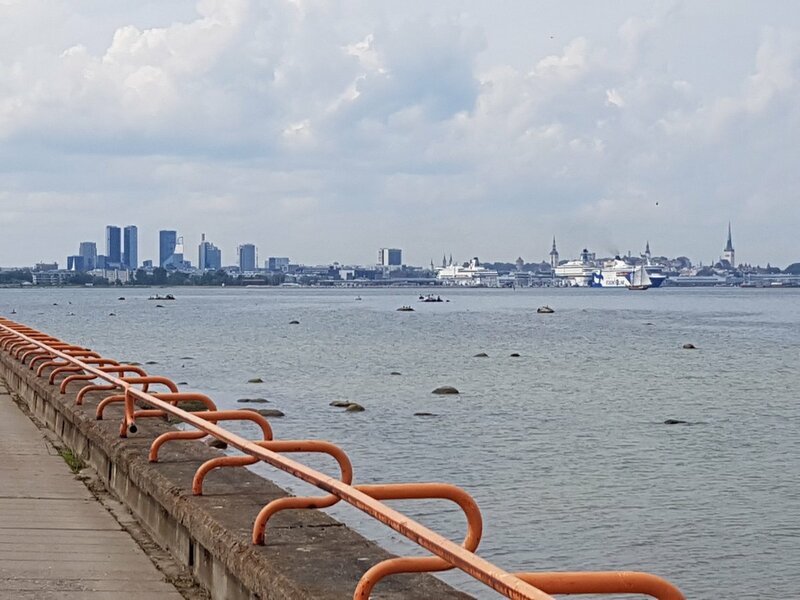 Anyhow, first impressions were that Tallinn’s transport system was very efficient, a thought which only became enhanced when reaching the city centre where buses, trams and taxis swamped the place like a scene from Futurama. Similar to St. Petersburg, and a previous football-related venture, the condition of these public modes would have fitted into a Dublin-based reeling in the years clip. Old, but charming in a sense, and understandable considering Estonia only gained independence from the Soviet Union in the late 80s. A trip to the ‘old town’, alongside a travelling comrade, LMFM’s Adrian Taaffe, brought us up windy, cobbled streets. There was a mix of contemporary and medieval-style songs blaring, which was in strange harmony with the beautiful landscape, as the streets filled with tourists. Imagine, well you can’t imagine. Modern Ireland doesn’t have the same character, which makes you wonder if the high rise apartment blocks and office spaces which have been erected around the place has done our tourist industry any good whatsoever. Perennial takers to the sky with the Lilywhites, No. 1 supporters Paddy and Iris McGuinness were located on the edge of ‘old town’ upon a chance encounter. Iris marvelled at the street-full of flower shops which had the most brilliant produce imaginable. So, as Kenny no doubt churned tactical ideas in his head for Thursday, Iris wondered if the pilot would allow a few souvenir roses on the plane. And what was even stranger was that several hours later, as Adrian and I sought a late-night feast at McDonald’s, these stalls remained operational. Maybe us Irish just ain’t romantic enough to make it worthwhile for around-the-clock florists. I say the venture was late-night, and it was, but not as late as it would have been had the three human sat-navs, charged with leading us back to the hotel and who will remain anonymous until such time as they redeem themselves, headed for home, and I mean home! As I said to Des Weir as they wandered down one street and then another, with us lagging in pursuit, if they were ‘the three wise men’, there may be no Catholic faith. Mad Murphy’s was the hub of Dundalk FC activity throughout the stay, and the venue where the two World Cup semi-finals were taken in by the convoy on tour in majority. 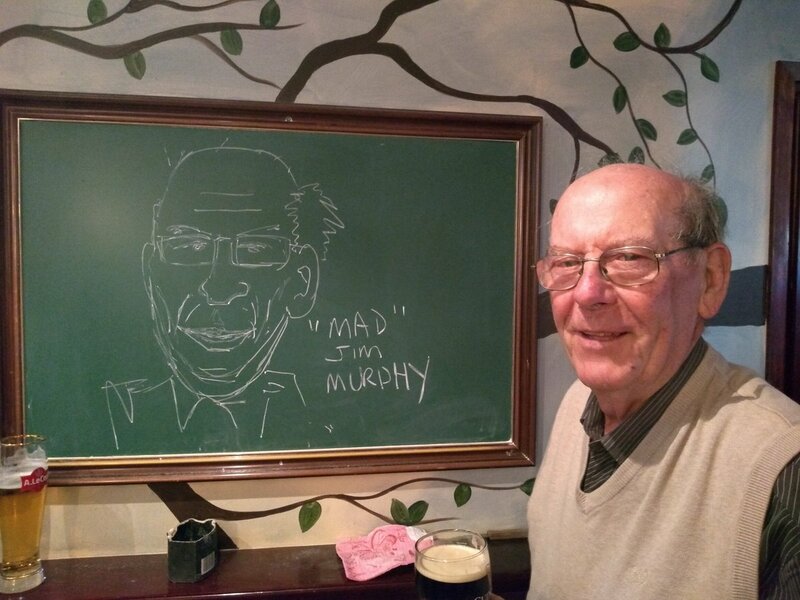 And not because the Voice of Oriel Park, Mickey Duffy, saw it fitting to chalk a caricature of the legend that is club historian, and lifelong fan, Jim Murphy on a board. Rest assured, if anyone’s ‘mad’, it’s not Jim. As reports came through of rain in Ireland, the sun just gazed wider on the other side of Europe. Trips were organised and this writer’s group of explorers headed for the port, mounting an 80ft monument which kissed the edge of the Baltic Sea. Our viewpoint was from a stone-built height commissioned by the communists during their decades of occupancy. The view was amongst the trip highlights. Fifty-km from Finland, the sun’s glaze on the Chelsea-blue sea accompanied some mountainous terrain in the distance and a few ships gliding to shore. The rest of Tallinn stood in the background. An artist’s paradise. Having taken in the press conference at the Kadriorg Stadium the night before, the surroundings were familiar by the time we booked in for the main event. Throughout the week, numbers were being bandied about how many were going to be there. But, as Brian Gartland adequately put in a tweet the day of our return, the following exceeded the predicted tally. In fact, it surpassed the number of Levadia supporters. The atmosphere within the open-ended ground was dictated by the visitors and they were brought to their feet when Dylan Connolly, one of several really impressive performers on the night, poked the victory-strike to the net. And with that goal, the icing was added to one of the great League of Ireland trips were many a friend was made. People who would ordinarily nod in acknowledgement around town got to know one another. Tallinn is class, Dundalk are class, you are class. Of course, the atmosphere was turned up a notch around the city as the visiting numbers were supplemented, but it never surpassed excitement, and harmless buoyancy. As the song partially goes about Dundalk’s No. 7, Michael Duffy, it was ‘wonderful’, it was ‘magical’. And, believe me, the boys did sing!